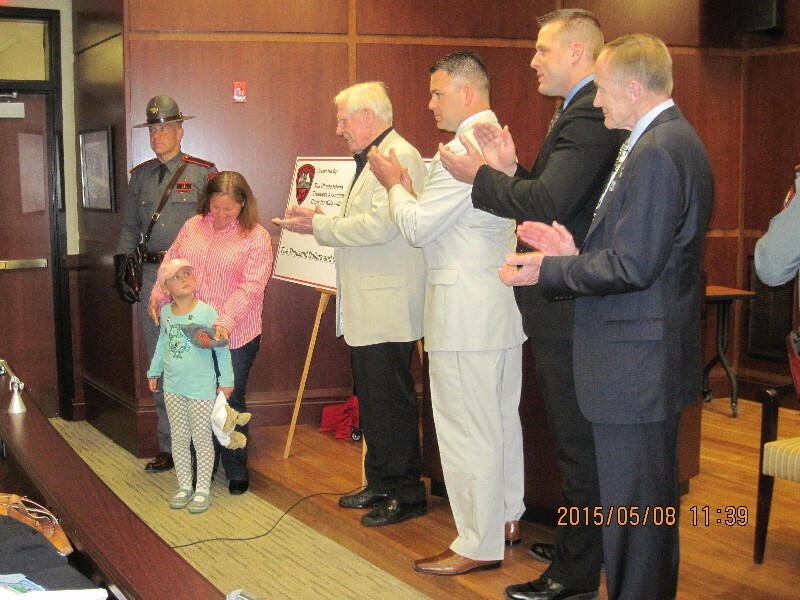 On May 8, 2015, Cops For Kids With Cancer went to the Rhode Island State Police Headquarters and made a $5,000.00 donation to the family of Kathyrn Silvia, a 5 year old girl from Wakefield, RI who has Rhabdomyosarcoma. In photo left to right, Trp. John Gadrow, Mother Lisa, Kathryn, Bob Faherty, Trp. Kevin Grace, Pres. RI Trp. Assoc. , Vice Pres. Ernie Adams, and Lieut. Det. MSP. William Coulter, Board CFKWC.